Fertilizer management is important for minimizing nutrient losses from intensive agroecosystems. An increasing amount of organic fertilizer has been applied to overcome the problems associated with mineral fertilizers. Thus, an understanding of the diversity and community structure changes in arbuscular mycorrhizal fungi (AMF) in response to long-term organic fertilizer management can be potentially significant in the development of nutrient management strategies. Here, a study was conducted to investigate the vertical distribution of AMF in a calcareous field and the temporal structure of AMF in maize roots with different levels of continuous fertilization over a 13-year period. T-RFLP and clone library construction were used to investigate AMF community in this study. Canonical correspondence analysis was performed to determine the significance of environmental variable that may affect the AMF community composition. Our results showed that the Shannon-Weiner and evenness indexes of soil AMF community decreased, while AMF richness was not significantly affected. Organic compost application reduced root colonization, while the negative influence of conventional inorganic fertilization was minor. The effect was significant at 13 leaf collar stage of maize. Crop phenology especially growth stages might override fertilizer supply in determining the community composition of active root inhabiting AM fungi. Significant differences in the community structure of soil AMF were observed between control and organic compost treatments in surface soil, and the community shift was primarily attributable to soil organic matter and nutrient contents (total nitrogen and carbon, Olsen-P, and exchangeable K). Vertical distribution of AMF was significantly related to soil electrical conductivity and pH values. Our results indicated that AMF community assemblage was complex and dependent on fertilization-mediated changes in soil properties, soil depth, and crop phenology. The modification of AMF communities by fertilization may have great impact on soil health and ecosystem services in intensive agroecosystems. The online version of this article ( https://doi.org/10.1007/s11368-019-02244-3) contains supplementary material, which is available to authorized users. 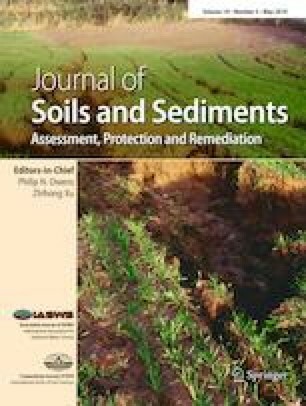 The authors thank Professor Ji Li of China Agricultural University for providing assistance with sampling at the experimental site. This work was financially supported by the National Key Research and Development Program of China (2017YFD0200200/2017YFD0200202/2016YFE0101100) and the National Natural Science Foundation of China (grant nos. 31272251, 31400528).